Sitting at the actual crossroads of Eurasia and, for centuries, being the gateway to both east and west, a place which traders from all over the world passed through and a land which was conquered by countless civilizations, from the Greeks to the Mongols and even the Russians in the 20th century, the cultural heritage of Uzbekistan is huge and it can be seen not only in the numerous palaces, fortresses and mosques, but also in the extremely mixed people’s faces, ranging from Mongolian to clear Indo-European features. Uzbekistan used to be the most important knowledge exchange center in the world, the stopover for important intellectuals, religious figures, traders and travelers in general, who all the historical buildings and caravanserais were built for, unlike in neighboring Kazakhstan and Kyrgyzstan, two countries which were mainly based on nomadism. 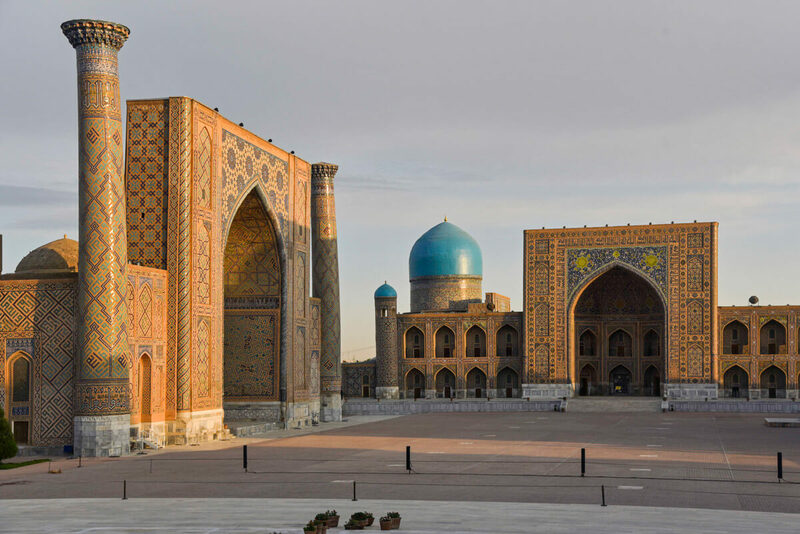 Today, Uzbekistan is really synonymous with the Silk Road, home of the three major Silk Road cities, composed of a magnificent architecture that can’t be rivaled anywhere else in the world, not even in Iran, I am afraid. This is the ultimate destination for architecture and history lovers, but also for travelers who want to visit a real off the beaten track destination, as outside of the three main touristic cities, including in the Fergana Valley and the Republic of Karakalpakstan, there is very little Western exposure and the people are extremely hospitable. I spent one entire month backpacking in Uzbekistan and, here, I have compiled all the places I visited in a 1 to 3-week itinerary. Unlike the rest of the Stans where the mountains are the highlight, one goes to Uzbekistan for city sightseeing, which means that it can be a year-round destination. 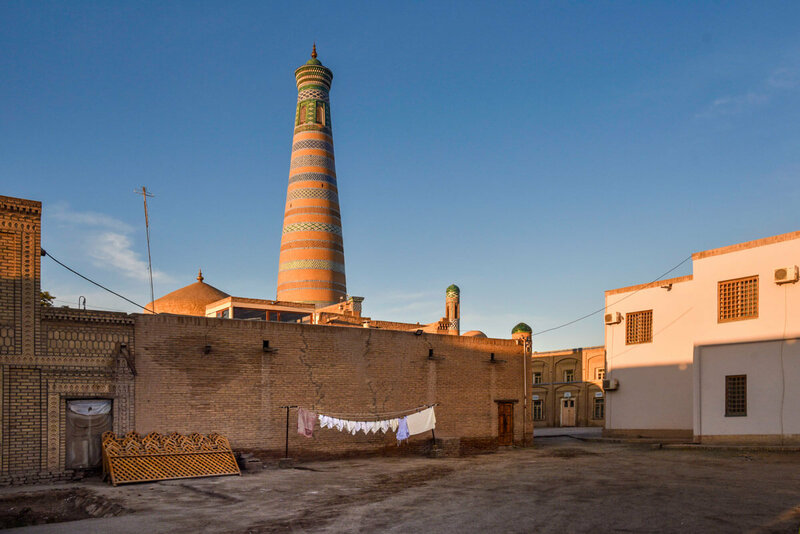 Nevertheless, bear in mind that summers are utterly hot, especially in Khiva and, in winter, temperatures may easily go below 0ºC. I was there from mid-October to mid-November and days were pretty mild and nights quite cold, around 5ºC. We also camped in Moynaq, in the Aral Sea, and temperatures went down to -5ºC. However, I think that it was a really good season to travel as there were few tourists and, during the day, the temperature was just perfect. Therefore, autumn and spring should be the best seasons to visit! Uzbekistan is a hot destination! Who the hell backpacks in Uzbekistan? 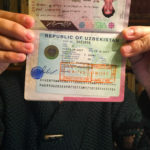 This is what most travelers say before booking their tickets to Uzbekistan, but you will be surprised to learn that this country is much more popular than you think! 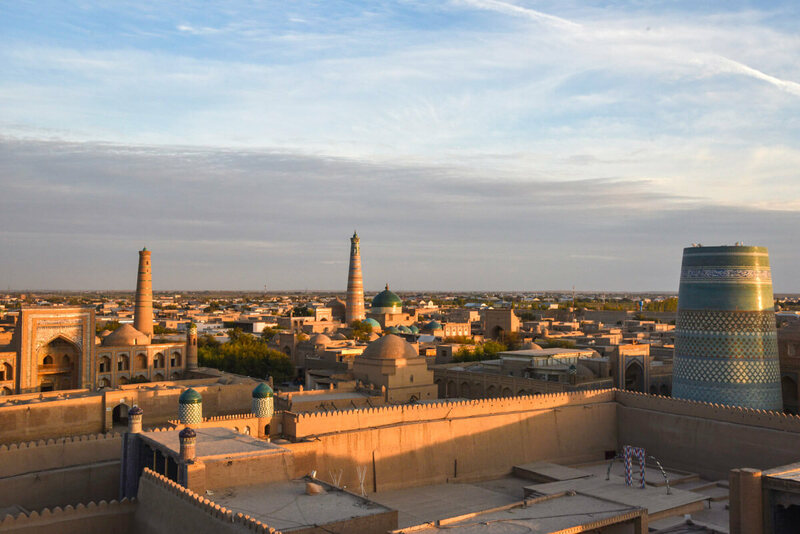 The three main Silk Road cities, Samarkand, Bukhara, and Khiva, tend to be swamped with, literally, tens of tour groups, so don’t be surprised at getting lost among all the souvenir shops or being caught in the occasional rip-off! Nevertheless, as soon as you step out of these three places, you are likely to be the only tourist. 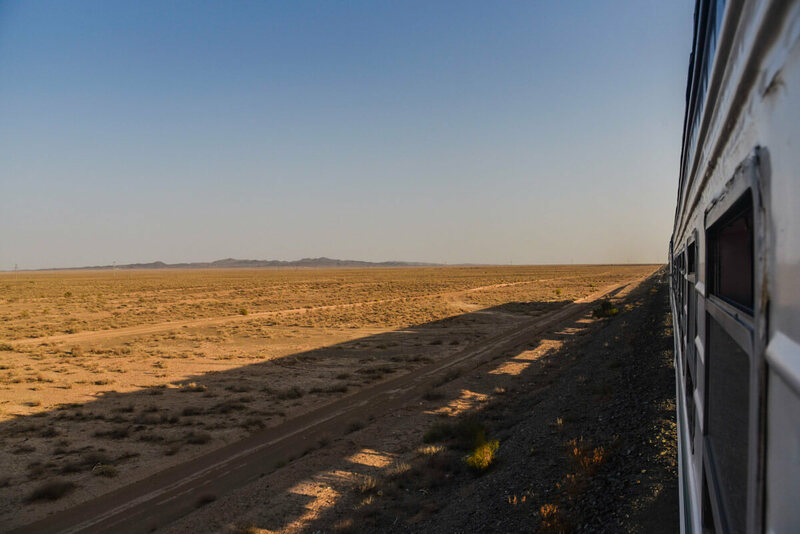 You can travel by train to pretty much everywhere, except Khiva and the Aral Sea, where you will need to take a bus or a local shared taxi. You can travel in both modern trains and old Russian trains, which is quite an experience. To check different train schedules, go to the Official Railway Website. However, it is a bit confusing, as results are shown in the Cyrillic alphabet and, in any case, you can’t buy them online with a foreign card, so you will have to go to the station anyways. Uzbekistan was once listed among the 20 safest countries, as it has one of the lowest crime rates in the world, so you should not worry about your safety, including women. 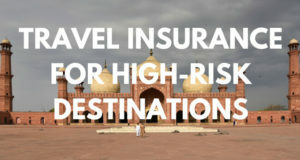 However, for backpacking in Uzbekistan and any other foreign country, you should always have valid travel insurance. During all my years of traveling, I have used World Nomads several times, as it is the only company that offers unlimited medical coverage. 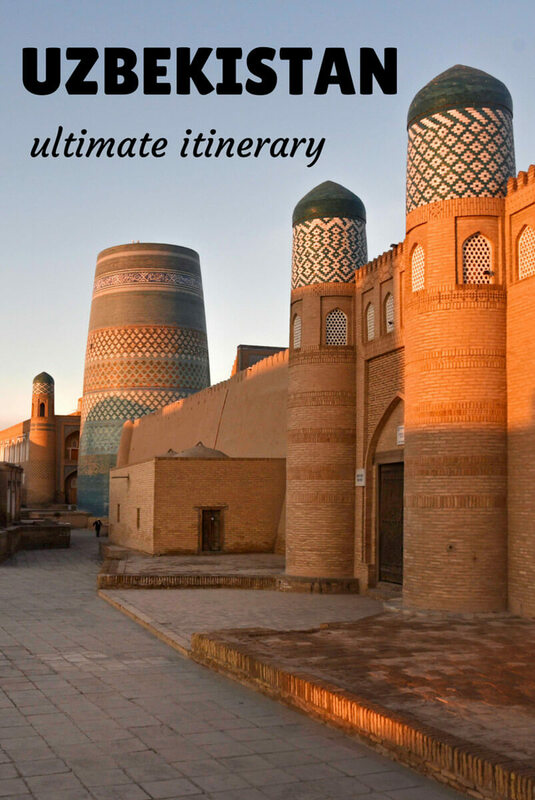 Bukhara, Samarkand, and Khiva are the highlights of Uzbekistan. 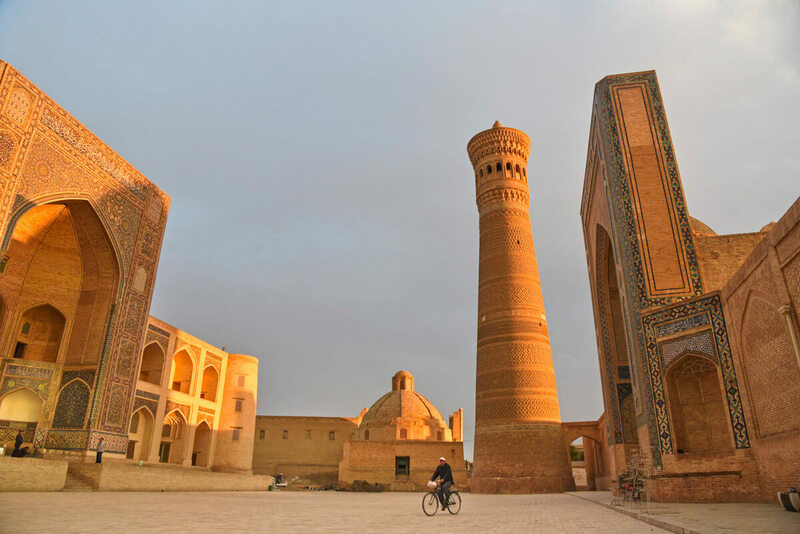 However, Khiva is around 1,000km away from the capital, so trying to fit it in a 1-week itinerary for Uzbekistan is not very realistic, unless you don’t mind rushing, of course, but personally, I am not a very big fan of that. Therefore, in 7 days, I recommend you visit Tashkent, Samarkand, and Bukhara. I liked Tashkent and spent 5 great days there. It is a very modern city, quite different from the other Central Asian capitals, composed of wide, modern avenues, fancy places, and top-end restaurants. At first, it looks like a very wealthy city and, to some extent, it really is but this development is more materialistic than social, as you can easily see that the city has little Western exposure, which can be seen in the way the people dress, the poor nightlife and, basically, that all the young people look very homogenous. For me, this was what made it particularly interesting but also, here you can get a glimpse of traditional Uzbekistan, by visiting the Chorsu bazaar, the largest in the country; and checking some real Islamic architecture at the Hazrat Imam Complex and the Kulkedash Madrassa. 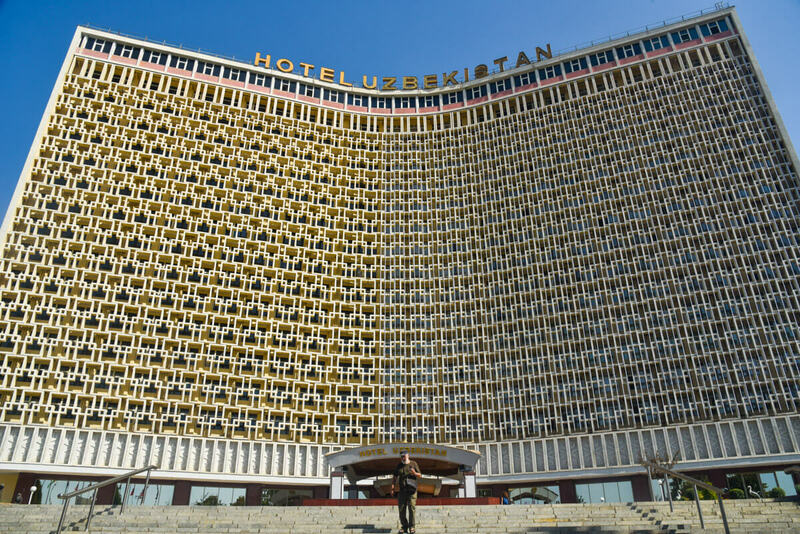 If you like Soviet stuff, don’t forget to take the metro and check the Hotel Uzbekistan, two real Soviet masterpieces. Forget what people say. 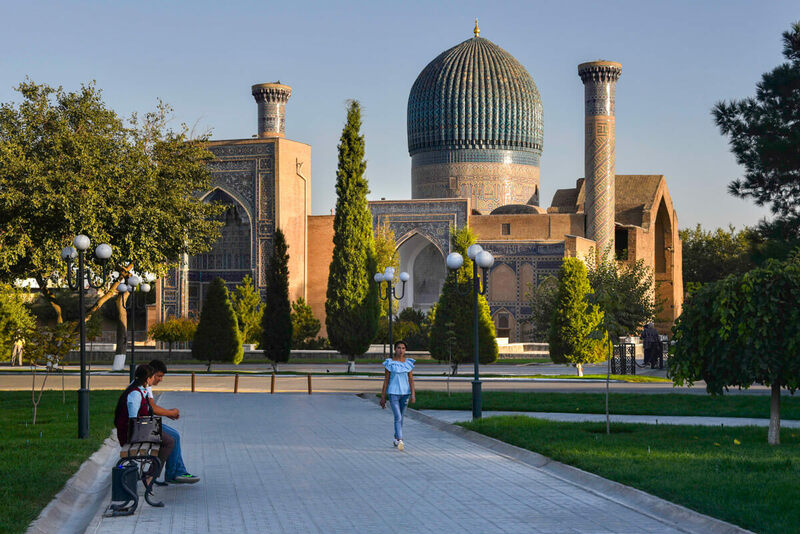 Tashkent is a city that you can’t miss when you go backpacking in Uzbekistan. Budget – Top Chan Hostel – The most popular hostel for backpackers, Top-Chan is always busy with plenty of travelers to share stories with. Mid-range – Hotel Uzbekistan – Not many things have changed in this hotel since it was opened during the time of the Soviet Union, so staying here must be a unique experience, like nowhere else. The nicest – Ichan Qal’a Hotel – The best-rated hotel in Tashkent, this rather Orient-themed hotel is beautifully decorated in a very traditional way. 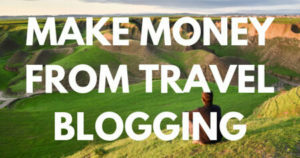 The best option for travelers with a larger budget. Whether you are going towards Samarkand or Fergana, the main train station is located here: 41.293289. 69.287721. You must buy your tickets in advance, preferably the day before. You can book them at the train station. Bring your passport. You should go to Samarkand the day after your arrival. It is very difficult to summarize the historical importance of Samarkand in just a few sentences but one important thing you should know is that this city has been hosting travelers for many centuries, so if you are one of those egocentric travelers who think that you are one of the first people to ever visit Samarkand, you are absolutely wrong because those madrassas have made people breathless since ancient times. It was Amir Timur who made it great again in the 14th century, so most buildings date from that period. Note that tickets for entering the sites range from 20,000UZS to 30,000UZS (2.50USD to 3.85USD). The Registan is the most imposing building in Uzbekistan and, perhaps, the most breathtaking Islamic building in the world, as its dimensions can’t be compared to anywhere else, not even the Shah mosque in Esfahan, Iran. Composed of three giant madrassas, you can easily spend the whole afternoon here. I recommend you come at sunrise, when nobody is around and, if you bribe the guard, you will be allowed to climb the minaret. Bibi Khanym would be my second favorite building, even though it is a little bit fake, as it was totally reconstructed due to an earthquake. By the way, inside the mosque, there is the stone that used to hold the world’s oldest Quran, today on display in Tashkent. Moreover, Shah-i Zinda is another popular building, consisting of different mausoleums, one of which is dedicated to Kusam ibn Abbas, a cousin of the Prophet Muhammad. I recommend you enter from above, through the graveyard, as you won’t pay an entrance fee and the pictures you can take from there are pretty cool. Last, around Registan, there are a few more madrassas and mosques which might look smaller in comparison but they are actually more impressive than those in Turkestan, a city I visited when I was backpacking in Kazakhstan. Also, don’t forget to visit the Siyob Bazaar. 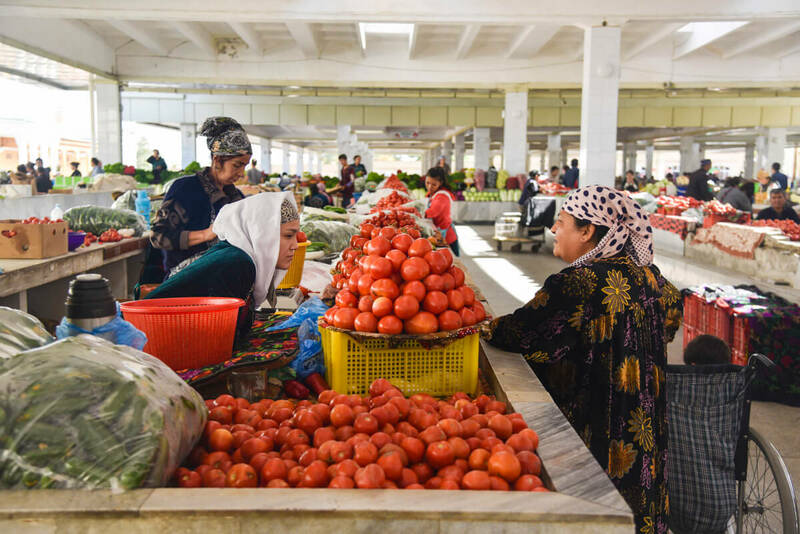 Because of the large number of tourists that visit Samarkand, some parts of the bazaar are getting a bit commercial, especially those selling traditional products like kurut, the dried cheese balls. However, today it is still pretty authentic. Ah! If you fancy some wine, in Samarkand, there is a wine cellar (Hovrekno) where you can do some wine tasting for just 40,000UZS (5USD) and taste 10 different types of local wine. We didn’t do the wine tour but, at the same winery, we bought 2 bottles of dry red for the same price. Budget Guest House – B&B Emir – A family-run hostel-guesthouse which is very well located and traditionally decorated. This is the best option for backpackers. Nicer (mid-range) – Jahongir Hotel – For couples and people with a larger budget, this also family-run hotel is super cozy and you will book it right away after just looking at the photos. Super nice decoration and only 5 minutes away from the Registan. One of the best options in town. The best – L’Agarmak – One of the best-rated hotels in town, this hotel has found the perfect balance between luxury and tradition. The breakfast is amazing and all the reviews are just great. We took the high-speed train which left at 8:30am sharp and cost 58,000UZS (7.50USD). It was a 2-hour journey. Bukhara is pretty and very different from its sister Samarkand. This is the birthplace of Imam Bukhari, a Muslim scholar and narrator of Prophet Muhammad, who wrote the Bukhari Shareef, the most important book about Islam after the Quran. Bukhara was a real landmark during the Silk Road times, especially due to its close location to Merv, today in Turkmenistan and one of the most important cities in the ancient world. 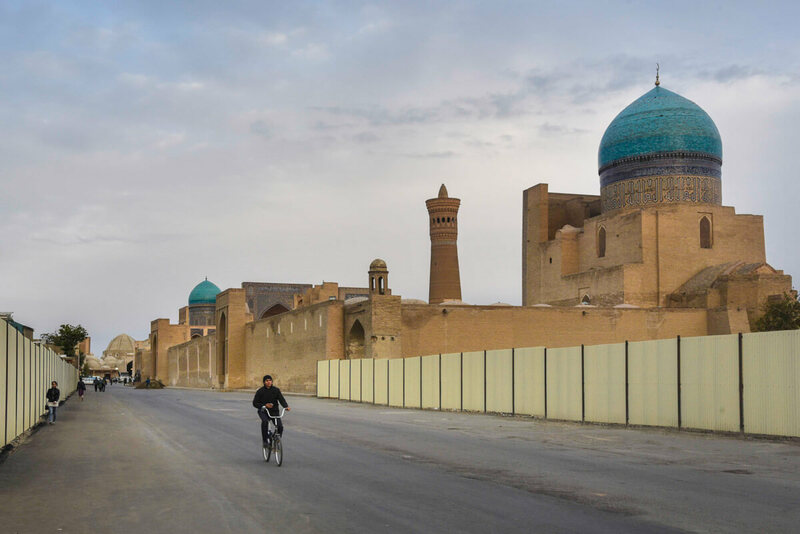 Whereas in Samarkand, all the buildings and sites are spread around the city, in Bukhara, most of them are within a very restored old town, which sometimes may even feel it is too restored. Nevertheless, Bukhara is actually beautiful and, even though the sites are not as big as in Samarkand, they are equally impressive and walking randomly in its narrow alleys is one of the highlights. Among all the sites, Chor Minor would be my favorite. It is a tiny mosque with very little historical importance but it is very cute and very different from any other mosque I had seen before. Nowadays, the inside is a souvenir shop and, for a little money, you can climb to the rooftop. Furthermore, the highlight and one of the most photogenic places in town is Po-i-Kalyan, a set of two impressive madrassas and the famous Kalyan minaret, also called the Tower of Death. Backpacker Hostel – Rumi – Super cheap, great backpacker atmosphere and run by a lovely family. The location is also great, 5-10 minutes from the old city. The top option for backpackers. Budget Guest House – Al Bukhari – This hotel is run by a very humble family, very Muslim as per Uzbek standards, so it is a nice chance to try some Uzbek hospitality. It is very clean and decorated with plenty of suzannies, a local traditional fabric. They were made by the mother of the house and you can buy one from her. Mid-range Hotel – Boutique Safiya – Built in a traditional Uzbek house, this is the preferred option for travelers with a larger budget. We took the high-speed train which only cost 48,000UZS (6USD) and took around 3 hours. Bukhara is about 575km from Tashkent. Take the high-speed train, which takes around 6 hours. 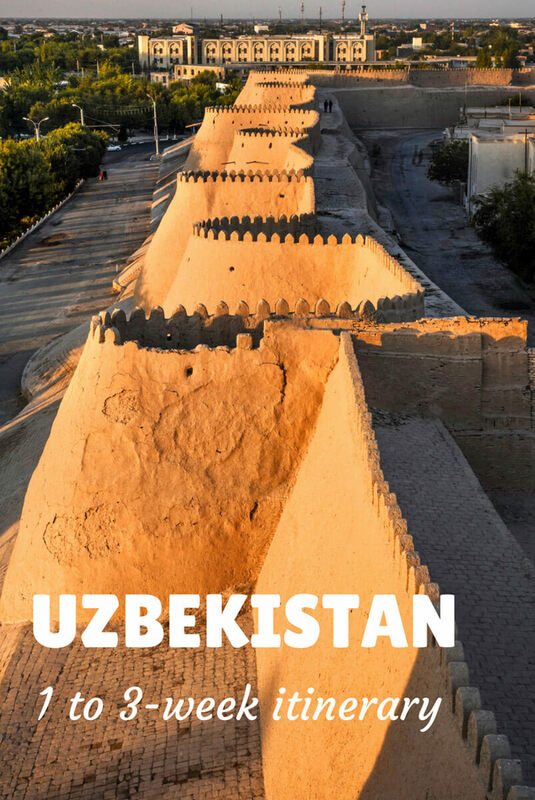 If you have 2 entire weeks for backpacking in Uzbekistan, you can add Khiva and the Fergana Valley to your travel itinerary. If you want to take a break from all the mosques and historical sites, go to the Fergana Valley, home to the nicest people in the country and the highlight when I was backpacking through Uzbekistan. The Fergana Valley is internationally known for being the most troubled place in Central Asia as, almost 100 hundred years ago, when Stalin created the 4 Stans, the region was ethnically mixed, so many people suddenly belonged to a Republic which did not match their ethnicity, like Uzbek people living on the Kyrgyz side. Over the decades, this developed into several conflicts and a very recent Civil War. On top of this, there is a city named Namangan which is where the most radical Muslim group in Central Asia was found. 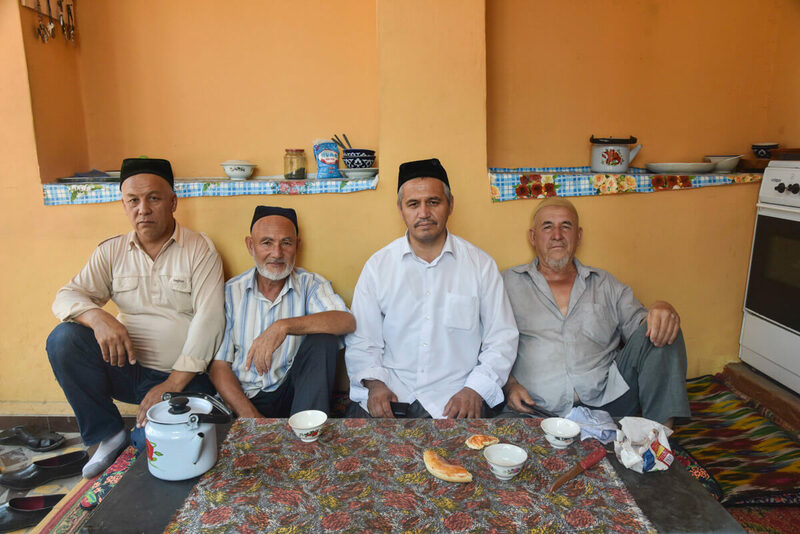 Fergana is a political destination but, also, here you will find the most hospitable people in the country, one of the very few places where even today, people will stop you in the street to invite you for some tea, a meal or just to improve their English. I spent one week in the Valley but, if you only have 3 days, go to Fergana City and use it as a base to explore the rest of the valley. 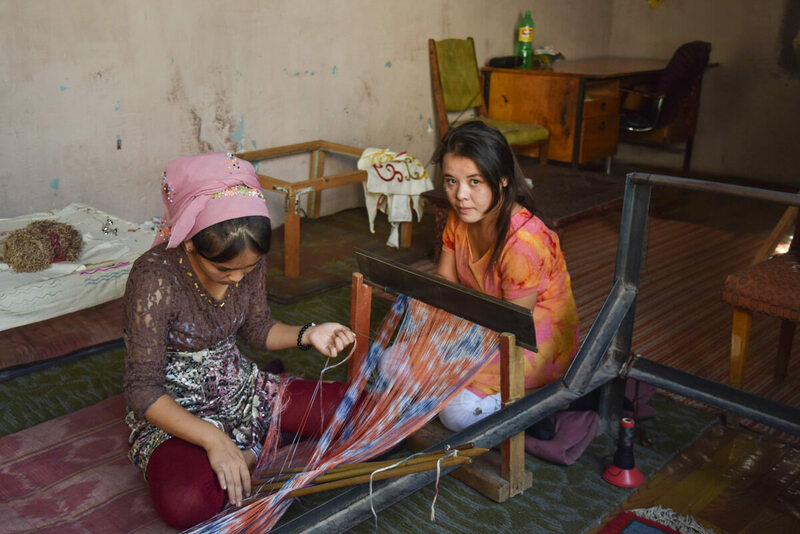 From there, you can visit Margilan and the Yodgorlik Silk Factory and, on the second day, go to Kokand, a lovely town where you find the Khudayar Khan Palace, a building from the 18th century and residence of the ruler. If you have more days, go to Namangan and Andijan. Budget Guest House – Sakura – The owner is a really kind man who will make you feel at home. Comfy beds and everything is brand-new. They have very few rooms, so book it in advance. Budget Guest House – Valentina Guest House – If Sakura is booked, I recommend you stay with Valentina, a local woman with a very strong character. We stayed here the first night in the city. I actually entered the Fergana Valley from Tajikistan at Konibodom. Read here the full report. There are, however, direct trains from Tashkent to Fergana City. They typically cost 52,000UZS (6.50USD) for a 3-4-hour journey. 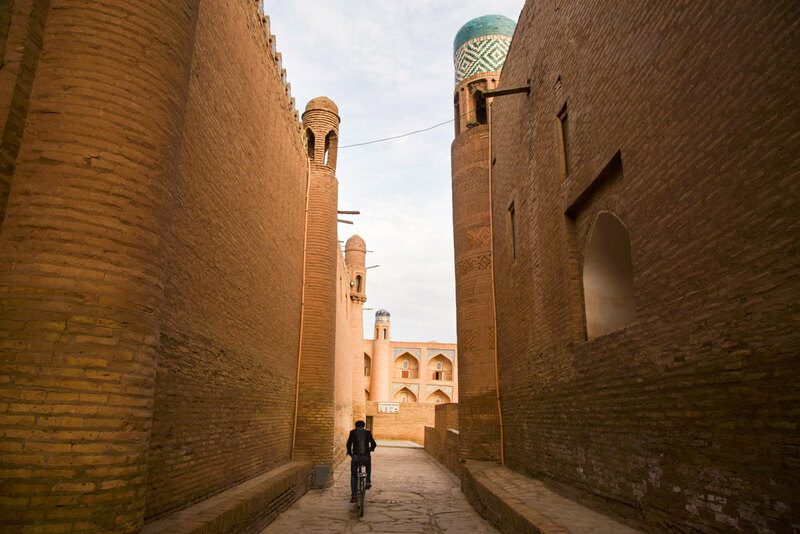 Khiva is my favorite city in Uzbekistan, as it is small, cute and very pleasant to walk around. I enjoyed my time there so much, working at the numerous terrace-cafés over endless cups of good coffee. Composed of mud-brick houses and super narrow alleys, Khiva is really similar to Yazd and, actually, when I posted photos on my Instagram, many people thought that they had been taken in Iran. This is a 2,500-year old city and the highlight is nothing else than wandering around its super narrow alleys while bumping into several minarets, mosques and traditional houses. I strongly recommend you wake up at sunrise, the only time of the day when the streets are free of tourists. All the sites are inside the old city (Ichon Qala) and there is something to see every few meters, the most famous places being Kalta Minor, the short and shabby minaret that is on all postcards; Turas Murad, the tallest orange minaret, given its position, it is better to climb it in the morning (opens at 8am and costs 7,000UZS – 1USD). At sunset, I recommend climbing the wall located next to the main entrance, where the Muhammad Aminkhan Madrassa is. From there, you view the full skyline of the old city. The ticket costs 7,000UZS. Budget Hotel – Farrukh Guest House – I enjoyed my time here so much. It has a super cool garden café where I spent many hours working. The breakfast is super nice, especially because they try to make something different every day. Nicer – B&B Zafarbek – Modest but it totally fulfills the need, so this is the best option for travelers with a larger budget. The nicest – Shaherezada Hotel – You can call it a luxury hotel but it is not that expensive, so it is the best value-for-money option. Like all good hotels, it is traditionally decorated and located in the old city. Pro-tip: Wake up at sunrise! Khiva is very far, almost 500km from Bukhara. There is no train station and the closest one is in Urgench, 35km away. 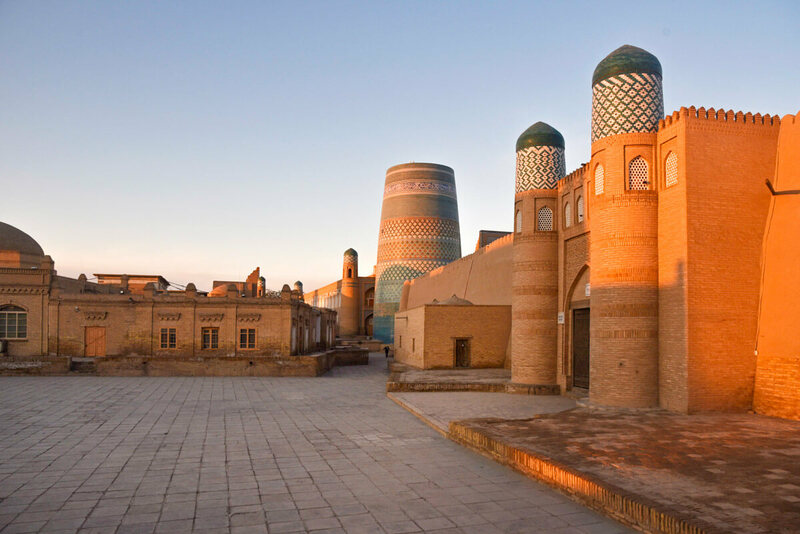 However, there is no direct train from Bukhara to Urgench, so the easiest and fastest way to get to Khiva is by local shared taxi. If you ask at your hotel for the price, they will say something between 75,000 and 100,000UZS per person (9.60 – 13USD). If you go to the actual taxi terminal at the bazaar, you may get it for 50,000-60,000UZS (6.40 – 7.70USD). That is what we paid. Somewhere in the Old City of Khiva, one of my favorite photos! Be ready for the 1,000km ride. The easiest way to do this is taking a fast train from Urgench, although I recommend you take the old Russian train, which takes double the time but it is a great experience. If you need to catch a flight, book the train ticket well in advance. If you have 3 weeks for backpacking in Uzbekistan, go to the Republic of Karakalpakstan, home to Nukus, the Aral Sea, and a few historical sites. If you think that 1 week for the Aral Sea and Nukus is too much, consider spending more time in the Fergana Valley or the other cities. Nukus is a very strange city. 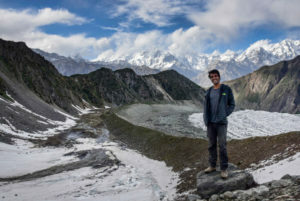 On the one hand, it is a real off the beaten track place, super remote and the capital of the Republic of Karakalpkastan, the poorest region in the country. On the other hand, it has the most important art collection in the country and in Central Asia, the Igor Savitsky Museum, the collection of a dude who decided to hide a treasure of Russian avant-garde art from the 20s and 30s here. The entrance costs 38,000UZS (4.85USD) but you may bring it down to 30,000UZS if you say you are a student. By the way, taking pictures is strictly forbidden. If you fancy some good coffee and western food, go to Café Cinnamon, very close to Jipek Joli Hotel. Nukus is the capital of the Republic of Karakalpakstan, a semi-autonomous region which has been always forgotten by the Uzbek Government. It has the highest unemployment rate, the lowest GDP and, due to the drought of the Aral Sea, the air is very polluted air that causes the lowest life expectancy in the region. Budget/mid-range Hotel – Jipek Joli – The only decent option in town but it’s pretty good. It has rooms for both backpackers and high-range travelers, including a yurt in the courtyard. You must book in advance, as rooms run out quickly. The shared local taxi to Nukus cost 30,000UZS per person (3.80USD). Alternatively, you can go by train from Urgench but it’s more expensive and slower: around 50,000UZS (6.40USD). 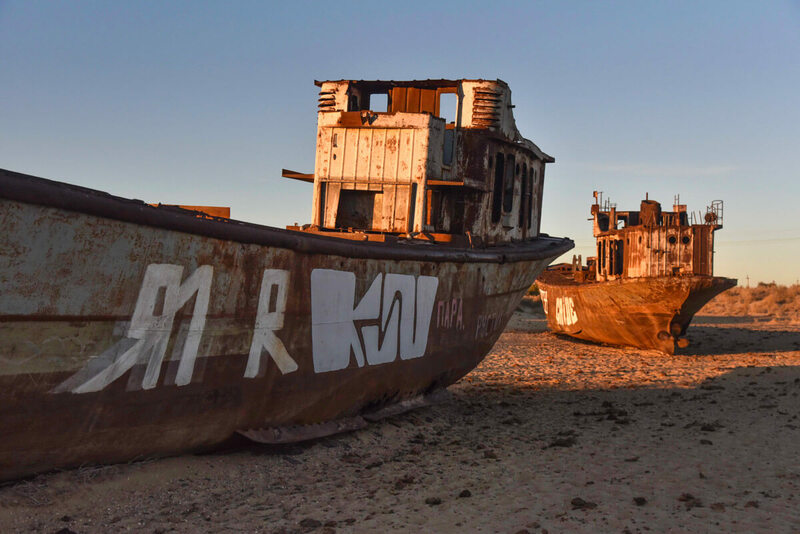 The boats in the Aral Sea! 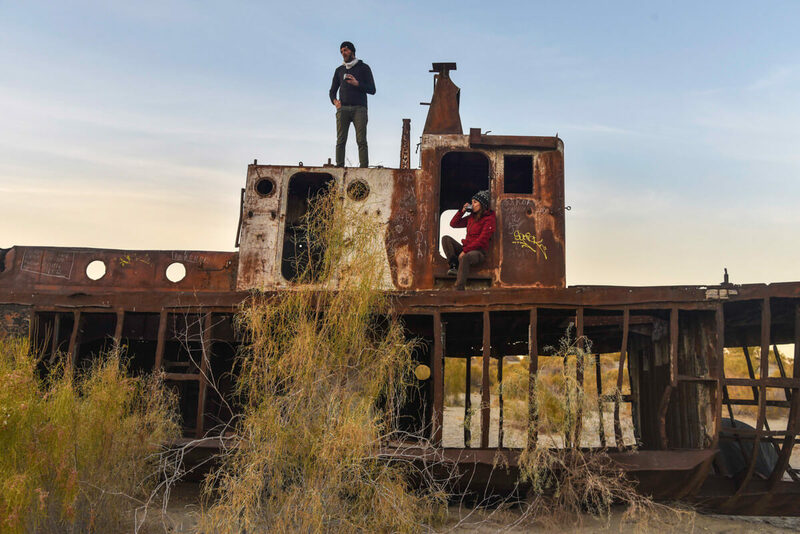 After traveling in Central Asia for so many months, I was excited to visit the Aral Sea because it was something very different from what I had seen before. The drought of the Aral Sea is one of the worst man-made environmental disasters ever and it was the consequence of deviating rivers to irrigate cotton plantations during the Soviet Union, as they wanted to become one of the world-top cotton exporters. The sea disappeared in a matter of decades and, today, on the Uzbek side, Moynaq, a town which used to be an important center for the fishing industry, is hundreds of kilometers away from the actual shore, where by the way, the level of salinization is so high that only microorganisms can live. In Moynaq there is the biggest ship graveyard, with more than 10 boats and much more accessible than in Kazakhstan. You can camp there (that is what we did) and there is also a yurt camp nearby. For more information, including how to get there and prices, read my guide to Moynaq and the Aral Sea in Uzbekistan. 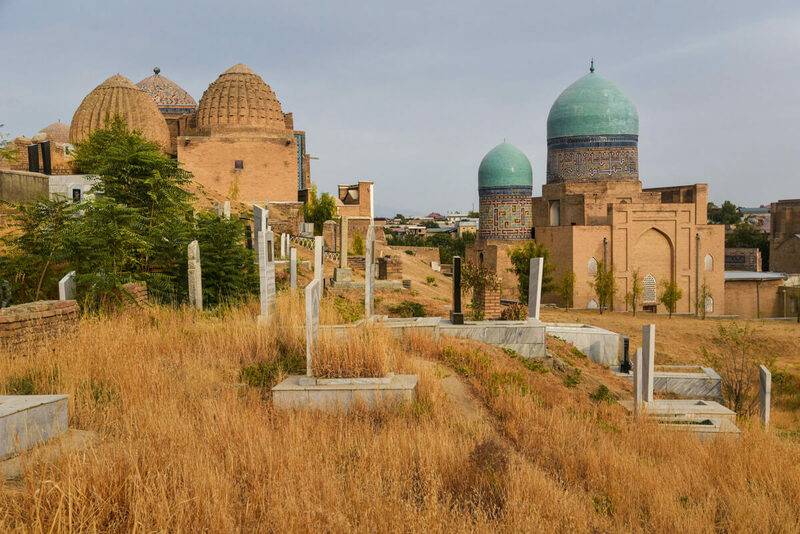 From the ancient desert castles of Khorezm to the desert of Kyzylkum and staying with real Karapalk nomads, there are many other things to do in this province. The only downside is that you need a car. The rest of the days – It depends – What is your plan? By the way, note that I visited all these places in 31 days. If you have more than 3 weeks for backpacking in Uzbekistan, instead of going to new places, just spend more days in each city, especially in the Fergana Valley. You won’t regret it. You want to go back to Tashkent – Take a Soviet train. It is a 30-hour journey but it is really worth it. I took it from Samarkand to Nukus. You want to enter Kazakhstan from Nukus – Great. Read the Kazakhstan-Uzbekistan border crossing at Tejen. You want to enter Tajikistan – You can enter from the border close to Samarkand but I used the border from the Fergana Valley at Konibodom. More information about Uzbekistan – Remember to check my 65 tips for traveling to Uzbekistan. 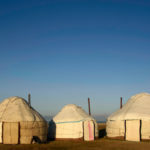 More articles about Central Asia – Check all my guides and articles about Tajikistan, Kyrgyzstan, and Kazakhstan. 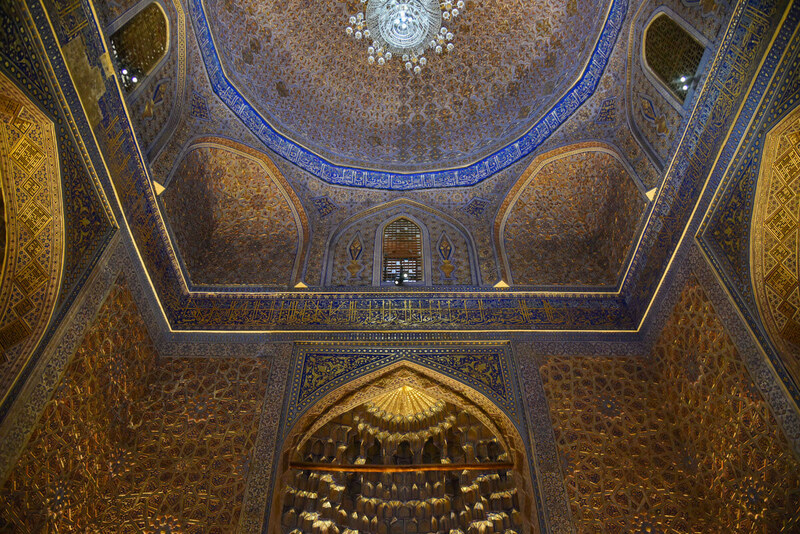 You are traveling to a neighboring country – Check my guides to Iran or Azerbaijan. Check Caravanistan – For the latest bureaucratic updates, check the Caravanistan website. Hey! Did you use a guide to get out to the Aral Sea? I saw that Jopek Joli (sp?) offers guides, but there weren’t prices listed last time I looked. Thanks! 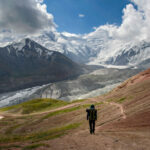 Hi from Bamyan, great itinerary breakdown. 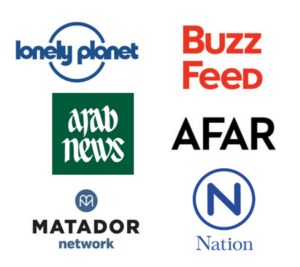 Thanks for the mention on Karakalpakstan!